The Devil … errr.. Tina Made Me Do It! When I got off work on Thursday afternoon, I kicked back on the sofa with a cup of tea and the most recent issue of The Essential Herbal Magazine. My intention was to relax for a short while, unwind from a busy day in the shop, and then have dinner waiting for my husband when he came in after dark from deer hunting. That’s not what happened. Instead, I read an article written by my friend, Tina Sams, the editor of the magazine, entitled “Grocery Store Preparedness”. The article was about how to stock your cupboards to be somewhat prepared for an unexpected cold or bout of the flu. It also included some instructions for a few herbal concoctions meant for prevention and easing symptoms. At this point I went off on a wild hare. Pictured above is my kitchen counter within 10 minutes of reading the article, just before it exploded. My herbal remedies arsenal has dwindled dangerously low, and I’ve procrastinated restocking for weeks. Tina’s article was just the motivation I needed, and dinner ended up being reheated leftovers, instead of the meatloaf I had originally planned. First on my agenda was getting a few tinctures started. 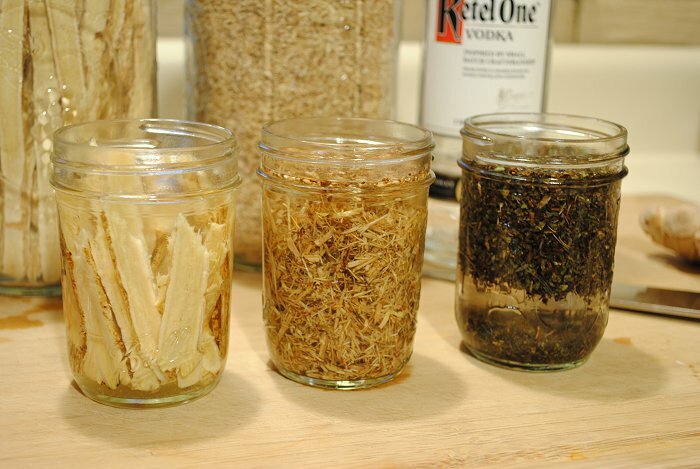 From left to right is Eleuthero root, Astragalus root, and Holy Basil (also known as Tulsi). 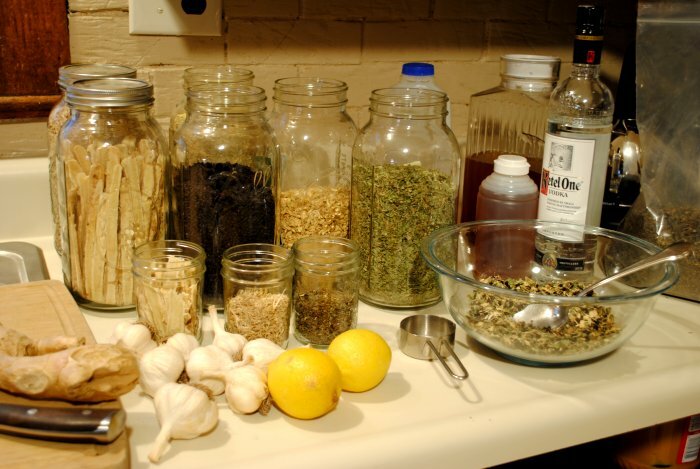 Making tinctures is quick and easy. I just fill a jar about 1/3 full of dried herb, and cover with vodka. I let it sit about 6 weeks before using. At that point it can be strained and bottled. I store mine in the jars and strain off what I need into 2 ounce dropper bottles as I need it. Eleuthero is an immune system booster, effective against colds and flu. Astragalus, one of my favorite preventives, is effective against viral infections, helps boost the production of white blood cells, and promotes interferon production in the body. Interferon is a chemical that disrupts the life cycle of a virus. Holy Basil is most commonly used for stress and anxiety, but it’s also a powerful adaptogen, rich in phytochemicals, which exhibits both antiviral and antibiotic effects. These three have a significant presence in my household, along with elderberry, which numerous studies have shown to be effective against multiple strains of influenza. 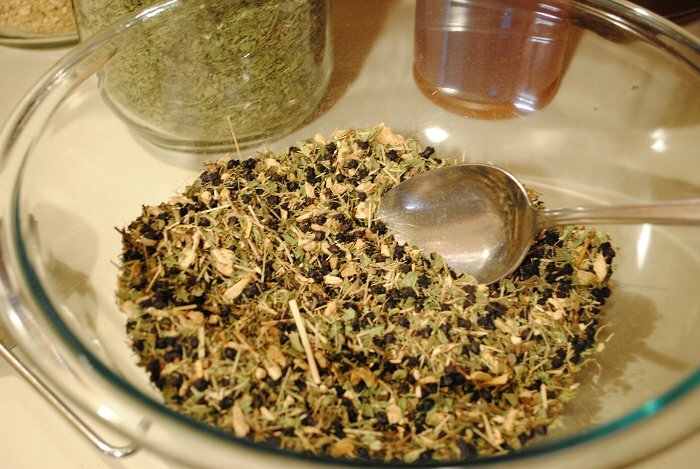 Next, I mixed up my favorite blend of herbal tea which I like to use when I feel a cold coming on, and also during a cold. I need to give it a name. I blend the following in a bowl and store it in and old bail lid canning jar. I like this blend because it meets the criteria for my personal preferences. 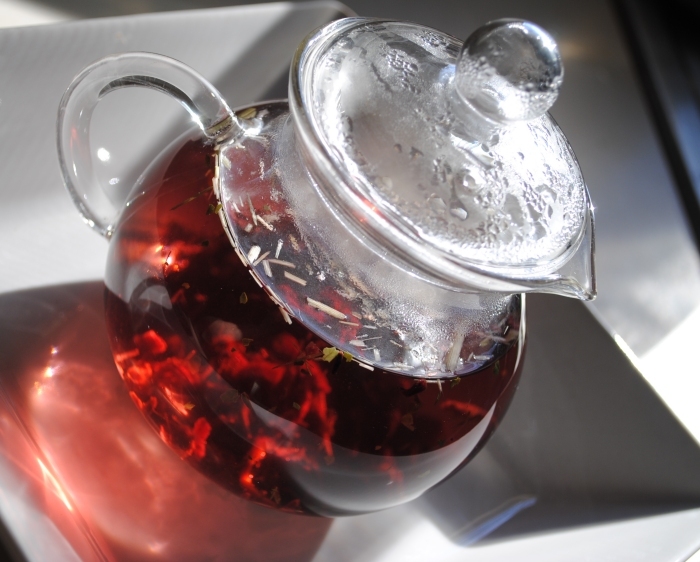 It tastes good – some zip is provided by the lemon verbena, lemongrass, and hibiscus (which also gives the tea a rich rosy color). The elderberry and Holy Basil help combat the virus, and the ginger provides a warming effect that can help break a sweat and fight off chills. Elderberry also helps promote sweating. 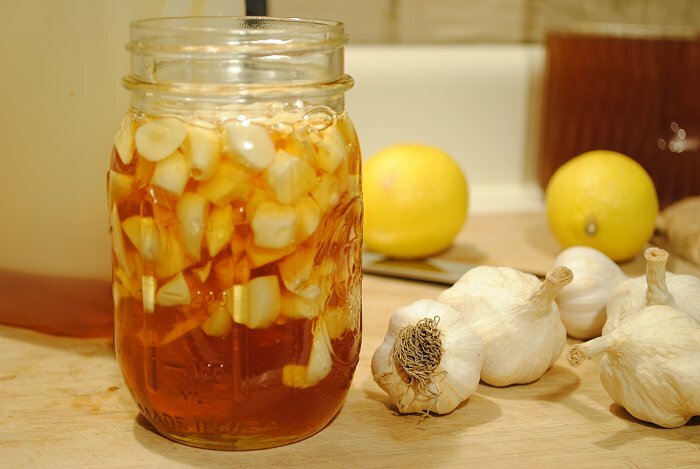 Next, I made a batch of garlic infused honey, recommended in Tina’s article. I’m not even going to go into the myriad benefits of garlic. You can Google it. When I eat garlic I seem to stink worse than most people. When I eat it raw, I fart – a lot. You want to stay far, far away from me when I’ve been eating raw garlic. I also made the Ginger Elixir and the Fire Cider included in Tina’s article. A friend of Tina’s and mine calls the Ginger Elixir “ginger lemon honey throat yum yum stuff”. That about sums it up. Since these are in the current issue of the magazine, I’m not going to give them here. I bet if you visit The Essential Herbals Facebook page and ask about it, Tina might share … or you could just subscribe to the magazine, and she’ll start you off with the current issue. Today is my day off and I’m using the time for some kitchen prep work which will make the next week run smoothly. I was planning to send my son to school with a homemade taco salad in his lunchbox tomorrow. I was out of the seasoning mix I use for any of my Tex-Mex dishes (chili, fajitas, tacos, etc). I’ll have to remember to write a little about our adventures in packed lunches at some later time. For those of you struggling to keep your children’s lunch menu interesting, I should share some of our packed lunch menus. Unlike many of the taco seasoning recipes floating around on the web, you will notice that my recipe lacks onion and garlic powder. 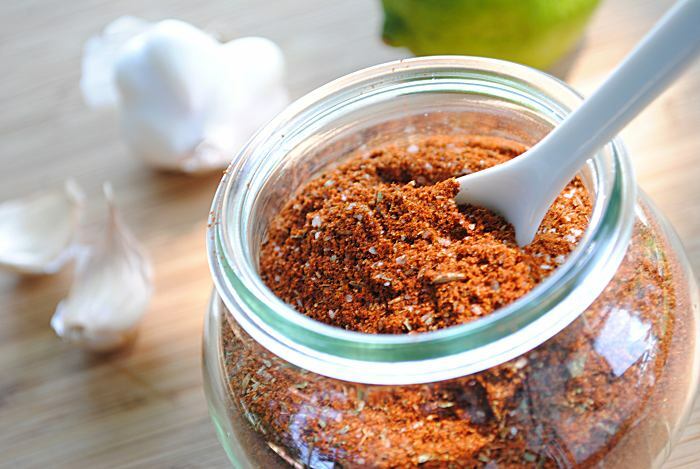 I like to use fresh garlic and onion when I cook up my chili or taco meat, so it’s not necessary in my spice blend. Once I’ve cooked up my ground beef and added my spice mix, I add two or three tablespoons of flour to the meat and cook it for another minute. I then add a little water and simmer to create slightly saucy meat mixture. I finish the whole thing off with a few squeezes of fresh lime juice to brighten up the flavor and give it a little extra zing. I try to use as many whole spices, and herbs that I grow myself in my kitchen. 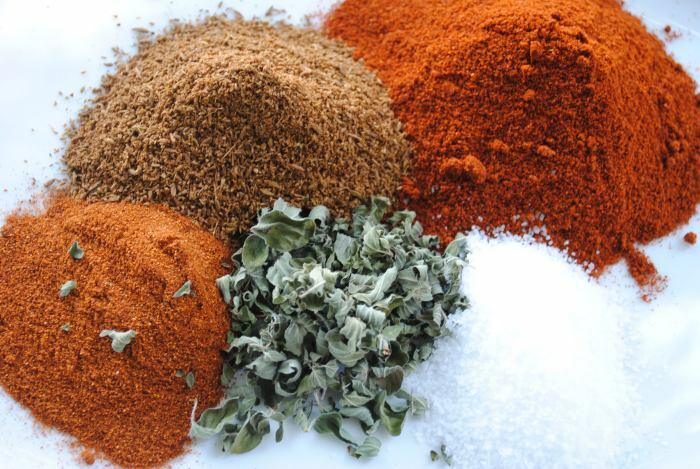 The flavor of freshly toasted and crushed herbs and spices is far superior to the stale pre-ground seasonings found in the grocery store aisles. In this particular spice blend I use oregano from my herb garden, and whole cumin seed that I toast in a cast iron skillet (until the seeds start to pop and smoke slightly) and grind with a mortar and pestle. If you haven’t figured it out by now, I like to do everything the hard way. The chili powder used is a matter of personal taste. I use a mild chili powder because my husband can’t handle spicy food. If I had my way I’d be using a wonderful rich, smoky chipotle powder that lurks in the back of my spice cupboard. Blend all spices together and store in a jar. I recently began using Weck canning jars, which are so popular in Germany and Europe. These 1/5 l deco jars stack perfectly in my spice cupboard. I love that something so pretty can also be so useful. I plant nasturtiums in my vegetable garden as a companion plant to help deter cucumber and squash beetles, as well as several other garden pests. In addition to being helpful in the garden, all parts of the plant are edible. The leaves and flowers can be used in salads, and earlier this summer I showed you how I make nasturtium vinegar. I also read some information indicating nasturtium has a place in herbal medicine with antibiotic, antifungal, antibacterial and possibly antiviral properties. I have yet to confirm if this information is true, and plan to do some digging around. Yesterday I picked nasturtium seeds and pickled them. 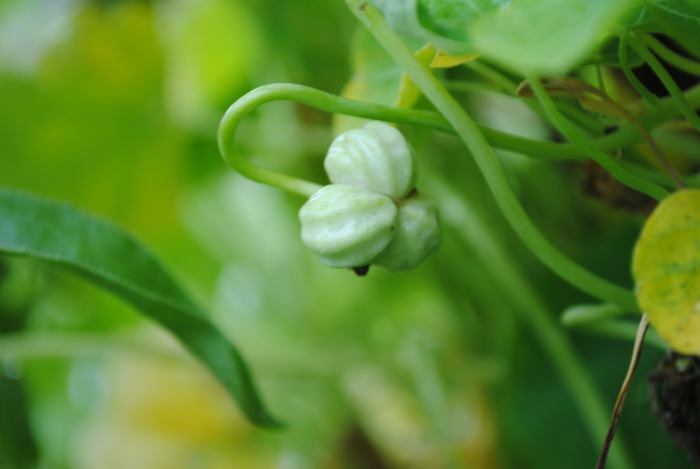 They grow in little clusters of three, and should be picked green for pickling. 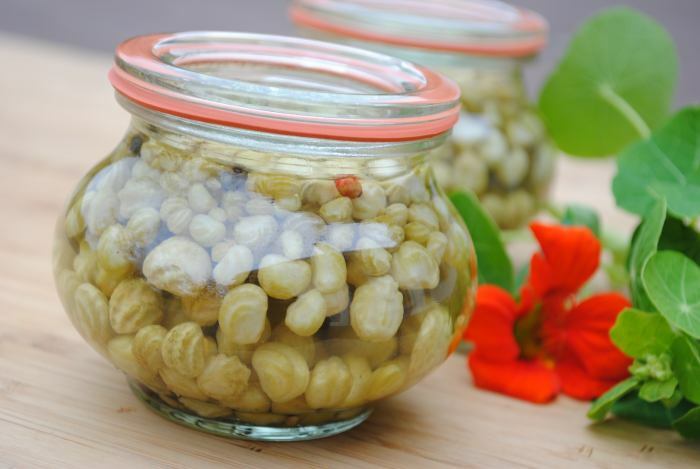 Pickled nasturtium seeds are also called nasturtium capers, poor man’s capers, and California capers. I made a very small batch consisting of 2 small jars. I’ll probably make a couple more jars before the first frost. Rinse seeds thoroughly. I placed mine in a bowl with a little salt and had to rub them a little bit to get them clean. It’s been raining, and the dead blossoms were stuck to the seeds. Follow standard practices for getting your canning jars ready. Place 6 peppercorns, half the fennel seeds, and one bay leaf in the bottom of each jar. Add seeds to jars. Combine vinegar and salt in a pan and bring up to a boil. Pour vinegar over seeds. Place lids on jars and water bath process the seeds for 10 minutes. 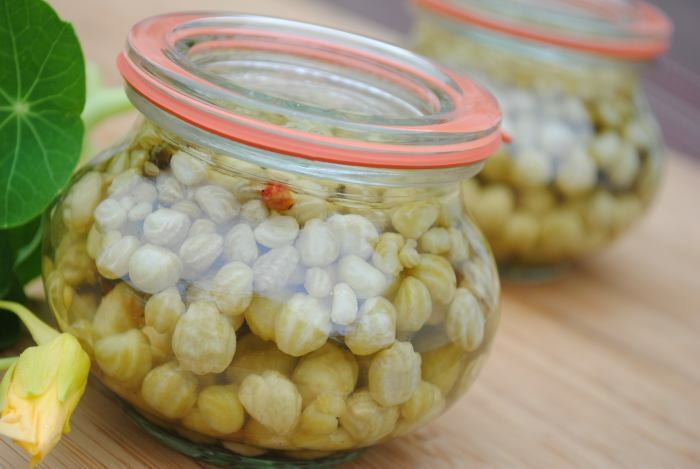 It’s best to allow the “capers” to rest in the jars for a few weeks to fully develop their pickled flavor.